Well came up with this idea a while ago and damn was I procrastinating with it. Finally got it done. ^^ Yup after nearly a week in the works the Liger made yet another aliens species. Seriously with all the ones I've made I could probably pretty easily populate a Scifi TV series with em. 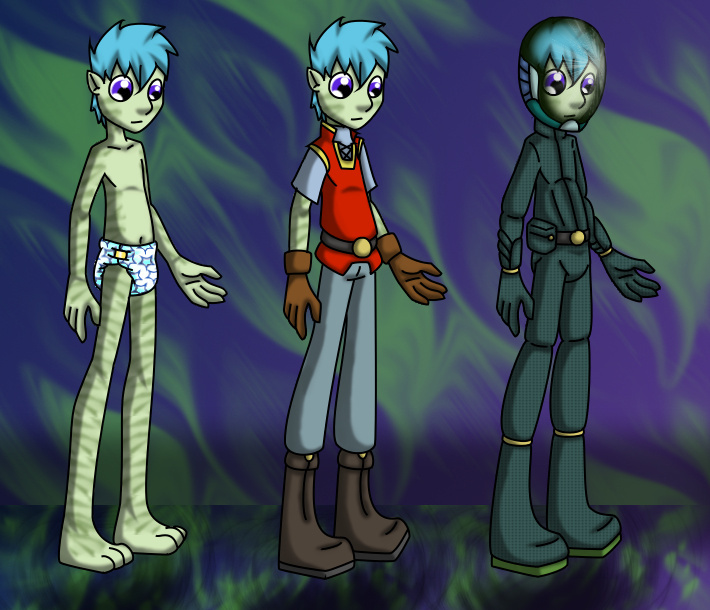 XD Anyway as usual Codex entry on the species first followed by stuff on the individual shown after. The Tevren are a remarkable species native to the forest world of Tevala. Standing on average just shorter than humans they are swift and nimble in even the roughest terrain with low level telepathic and telekenetic ability allowing them to deal with most obstetrical though. Most outstanding of all is their long life. Tevren are functionally immortal due to a chemical produced by a species of tree on Tevala called The Eternal Growth. The Teveren have no knowledge of the origins of these trees other than it was they who spread them across the planet as their own ancestors spread out. With several generations eating the tree's fruit and breathing the chemical it produced they began to incorporate it on a fundamental level of their biochemistry. While it at first merely extended their lives in addition to having healing effects it is now something they cannot do without. Being deprived of it for several days will cause what to an offworlder appears to be accelerated aging as their bodies slowly break down over the course of a few days. Hence why outside their native environment they must wear an environmental suit. On a societal level they are a very open and forward thinking species. Their form of government is via Consensus. Every member of their society from age 2 is given an implant that augments their natural telepathic ability and allows instant access to their knowledge base and upon maturation participation within the decision making of their world. There are no representatives among themselves as each individual represents themselves and has a vote in what they do. At present the Tevren are founding dome colonies on various worlds and putting forward their medical expertise to other species hoping to share in what has granted them a measure of immortality. The same chemical that allows them their immortality will still rejuvenate an offworlder to their prime with prolonged exposure of a year or two. Concentrated forms of the chemical applied to wounds can allow for accelerated healing and even the regeneration of lost limbs. It should come as no surprise however that many would desire to simply take what they desire. Tevala has been attacked on several occasions by various factions hoping to take the planet. No attempt has been even marginally successful as the Teveren fleet heavily guards their homeworld and treaties with them now see the military forces of many other species come to their colonies' aide in times of need if their own fleets cannot arrive in time. Hey there. I'm Vones and this is my first journal entry. I just got accepted to the interspecies medical exchange program! Can't believe my luck. I get to go travel and live on an alien world. Earth I hear. It's the homeworld for humans. I've always wondered what their world was like. I heard it's got a lot of variety. Guess that explains the variance you see in them. But anyway this should be pretty fun. I'll be working in a human hospital which will be using some of the medical stuff we've provided. Basically I'm there to get some real world medical experience and to help out with the tech humans may not be as familair with. Anyway I'm ready for the trip. This'll be the first time I've traveled offworld on my own. I remember visiting a lot of places with dad. He's still so proud of me. Heh. Guess this'll also be an excuse to stay diapered up most of the time. Kind of a necessity with a suit as well you gotta go sometime and you can't exactly take the suit off to go and such. Course it helps that I like em. Man I can't believe I'm writing this. Ah well my eyes only so I can ramble about personal stuff. Wonder how selective I should be with what I pack? Do I bring more than one stuffed animal? Probably just one I think. Don't wanna seem to strange to the roomy who's said he's already got the in home environmental thing going. He says whatever's in the air to make us immortal smells a bit like apples. Heh. No idea what an apple is other than food of some sort. I'll have to look it up and maybe try it when I get there. Well enough meandering for tonight. I'll write again tomorrow when I get a chance. Well hope you guys liked the pic and the info stuff.